I like the way my blackberry handles multiple email accounts. 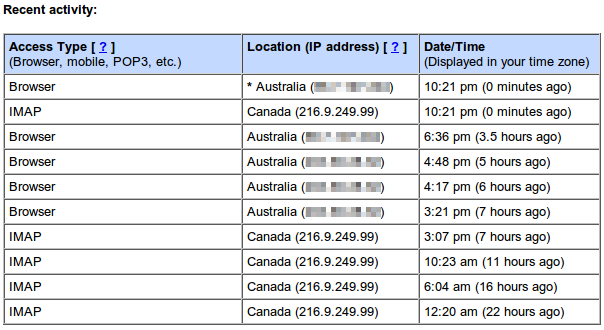 RIM servers effortlessly stream my gmail traffic directly to me wherever I am, handling two-way sync, calendars and contacts with ease. 216.9.249.99 turns out to be bda-216-9-249-99.bis3.ap.blackberry.com and is the first time a foreign IP has been handling my mail for an extended period. They have Australian servers that work perfectly well, and I cant find any notices about local downtime. I'm not entirely happy with this, we'll have to see if it stays. Edit: A week later, It's still all Canada. 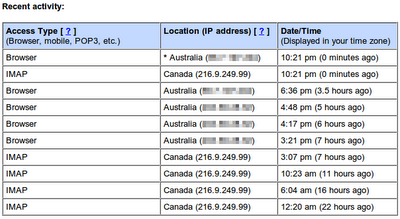 Either google has reclassified all RIM IP space as physically in canada, or RIM has made a fairly drastic change to how they access your email account.